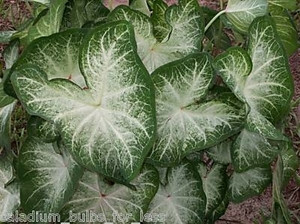 The Grey Ghost is a beautiful white caladium that has a creamy white center with white veins and Green border. It'll look great planted in those sunny areas of your landscape. It'll look really nice if it gets a little shade!! The Grey Ghost produces a nice full plant! !